One of my favorite franchises growing up, early in my life-long and life-defining consumption of media, was the Ocean’s Eleven reboot. I bonded with my mom renting each of the three films when they hit the shelves of our local movie store, and I would talk about how fun and intricate the plots were with my close friend down the street. The three films – or rather two films, as Ocean’s Twelve (2004) is the Temple Of Doom (1984) mistake we try to forget about – are straight-forward heist films premised on a con-man named Danny Ocean (George Clooney) gathering a team of crooks, each with a unique skillset, to help him rob a casino. These films are fantastic; they’re fun, well-structured, and perfectly balance the build-up of tension and drama with ample focus on the main and supporting characters. However, with the ironic exception of Ocean’s Twelve, none of the members of Danny Ocean’s gang include women and the films themselves barely include any women at all. Perhaps it was only inevitable that in 2018, with Hollywood more or less trying to cash in on third-wave feminism by boiling it down to the simplistic rhetoric of “more women,” there would be an all-female soft reboot of the franchise. And even though no one asked for it, we are given Ocean’s Eight (2018), which is such a watered-down version of the Clooney films that they couldn’t even get enough actresses to make it a full eleven (I guess so they have room to make another trilogy out of this), but is still a well-enough-made film that you’ll have a good time watching. Ocean’s Eight begins with Debbie Ocean (Sandra Bullock), the sister of the deceased Danny Ocean, leaving jail several years after she was arrested for art fraud. Apparently the knack for high-profile crime runs in the family, and immediately after Debbie leaves prison she cons her way into a luxury hotel room where she starts to make calls to set into motion the heist that she planned while in prison. 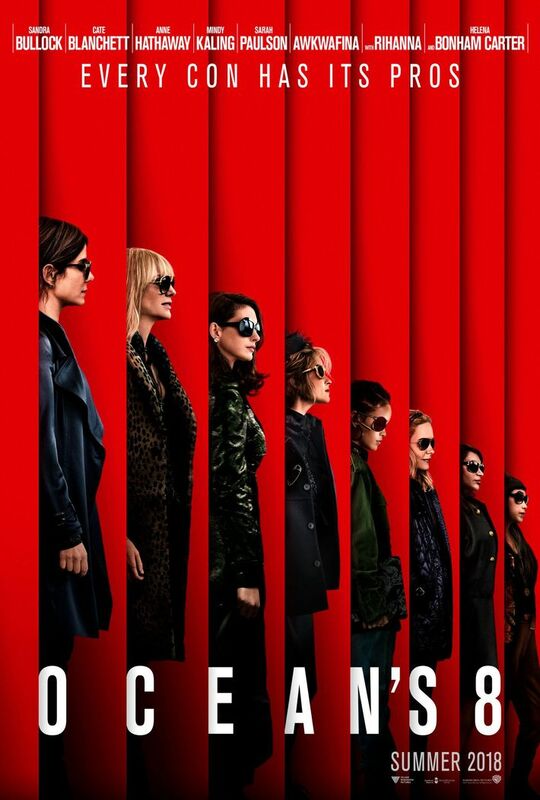 She meets up with her former partner-in-crime Lou (Cate Blanchett), and the two of them gather a team of five other people (yes, your math is correct) in order to steal a six pound diamond necklace worth 150 million dollars off of the neck of unwitting actress Daphne Kluger (Anne Hathaway). The team includes a failing dress designer named Rose (Helena Bonham Carter), a jewelry maker who still works for and lives with her mom named Amita (Mindy Kaling), a stoner computer hacker called Nine-ball (Rihanna), a street hustler and pickpocket named Constance (Awkwafina), and Tammy, a housewife who sells stolen goods out of her garage (Sarah Paulson). If you think this team sounds unimpressive, you’re not alone. This isn’t exactly the crack team of suave criminal experts you would expect to be equipped and skilled enough to tackle a heist at the Met Gala, and this approach is a double-edged sword. Obviously if you’re going to make another film in the Ocean’s franchise or another heist film in general, you’re going to need to change up the approach a bit. Director Gary Ross decides to go with a less serious tone and it certainly helps create a more fun and amusing atmosphere for the film, enabling such scenes as when the nervous fashion designer Rose fumbles her way through a meeting and suburban Tammy lies to her kid about needing to go perform a high profile heist, all while street-smart Constance cracks wise. Plus, giving everybody more defined motivations makes them more relatable as people and makes it easier to root for them. It also just flat out makes sense that Debbie Ocean would want to go with a slightly more low-key approach to the heist by bringing in a team of underappreciated women with underappreciated skills. She outright admits to her partners that a team of women will go unnoticed while pulling off something like this. They’re using sexism to their advantage. That’s just awesome. However, part of what makes the original films so good is the fact that the criminals in attendance are undisputed experts in whatever field they’re in, and Ocean’s Eleven goes out of its way to establish that Danny Ocean’s heist is so intensely difficult and so high-profile that it requires an entire eleven-person team of experts to pull it off. This is unfortunately where the new film severely lacks: the stakes. Blanchett saved the production time and money by dressing up as Bob Dylan again. Even with the solid character work from the actresses, you never get the sense that anything this group is about to pull off is going to be difficult. I get that Lou and Debbie are tried and true criminals, but every single step of this operation is executed way too smoothly and effortlessly to the point where things essentially stop making sense. Everyone gets put into place for the heist through montage, and the few instances of dramatic hiccups that could complicate the heist don’t because they are so easily resolved. I can think of maybe three or four things that were meant to be obstacles but aren’t because of how little they end up mattering. They can’t get the multi-million dollar necklace off without a special magnet but uhh oh wait good thing Nine-ball has a cousin who can just made them one. Lou is worried that Debbie is only motivated by getting revenge on the ex-boyfriend that put her in prison, but Debbie just says she isn’t and not to worry about it and that’s it. I don’t even know the point of Sarah Paulson’s character. The principal factor that makes any of this work, even remotely, is the film’s confidence. The pacing is brisk and gets you excited for what’s to come, with exception of the last 20 minutes which are disappointingly slow; and the acting, even with the surface-level characterization, is charismatic. Ocean’s Eight is comparable to a TV crime show, where what you’re watching isn’t technically bad but your level of engagement is basically on autopilot. I’m sure that’s all Ocean’s Eight ever wanted to be: a light and fun heist film. The fact that some of the cast members have been reacting so poorly to the mixed reviews is honestly hilarious and embarrassing. This reboot of a long forgotten franchise is not the hill you want to have a performative battle on. I enjoyed this film despite its glaring flaws and I know other men have as well, but I have also seen female critics whose work I admire review it negatively. Diversity in film criticism, much like in any field, matters immensely, but to attempt to take away a critic’s agency is foolish. It hurts the art form and it hurts your career, even if you’re protected by your privilege in a problematic industry that champions the work of racists and pedophiles. See Ocean’s Eight, or don’t, it doesn’t matter. It’s diverse and features a strong female cast, but it’s as forgettable as the better episodes of Law & Order. I did enjoy the use of “These boots were made for walkin,’” as it’s one of the best usages of that song since Full Metal Jacket (1987), and cameos from fan-favorite characters from the previous trilogy like Elliot Gould are really fun. Just don’t tell Cate Blanchett because she’ll revoke my feminism card. Ocean’s Eight is not a very good movie, but it’s plenty competent and I enjoy heist films and the Ocean’s franchise in general so I was pretty into this reboot. The film lacks a lot of drama and tension – pretty much its main saving graces are the charismatic character performances from the whole cast, the exciting energy this film exudes, which unfortunately peters out during the last 20 or so minutes, and one of the best uses of “These Boots Are Made For Walkin'” since Full Metal Jacket. Previous Previous post: Hereditary (2018) is the hot new horror darling from A24. Next Next post: Incredibles 2 (2018) is incredibly satisfying.